Before you start, place the bag of chocolate chips in the freezer. Open the bag of marshmallows, and set aside about 1/4 of the bag. Make sure you bought the 16oz bag of marshies. If you accidentally bought the 12oz, decrease the butter by 1 tablespoon. In a huge bowl in the microwave, melt the 5 tablespoons of butter. It takes about 30-60 seconds depending on how cold the butter is. Take the bowl out of the microwave, and mix in the 3/4 of remaining marshmallows from the bag. Coat the marshmallows in the butter by stirring with a spatula. Place bowl back into the the microwave and heat on high for 1 1/2 minutes. 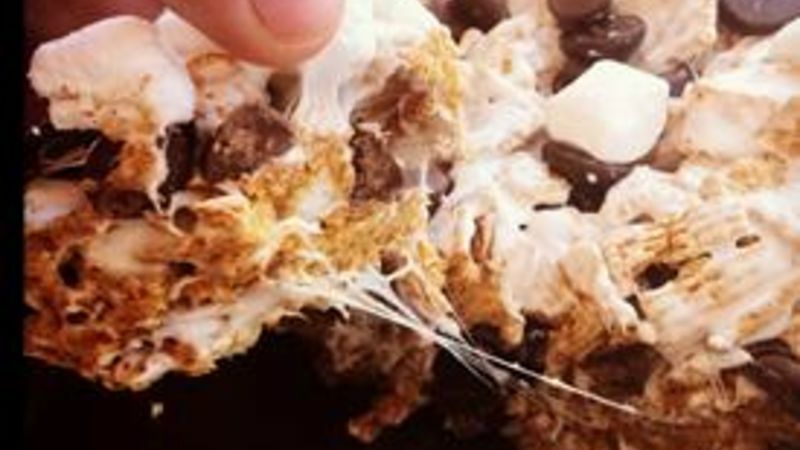 Remove marshmallows and stir with spatula until they are mixed well and all gooey. Take the box of Golden Grahams and add in a cup or so at a time. After each cup is added, stir the marshmallows around until the pieces of cereal are well coated. Take the remaining 1/4 bag of marshmallows that you set aside at the start, and mix those into the giant bowl. Next, add in the frozen bag of chocolate chips. Again, doing this a half cup or so at a time will help it mix it better, and prevent the chips from ending up on the bottom of the bowl getting all melty. Find a 9x9 (for super thick) or 9 x13 (for regular sized) pan. Spray bottom with non-stick cooking spray and pour mixture in. Flatten it all together with the spatula and let sit. If you can't wait, the bars will be droopy but delicious. Otherwise, let those bad boys set in the pan for a few hours. I found that six hours was about the best set time.